For years I have wanted to watch this movie but kept putting it on the back burner - it sat on my Netflix queue for a long time. Maybe it was the almost four hour length or possibly the serious nature of the movie - not sure. Last weekend Ann and I settled in for a long night of viewing. Firstly, even though it was not completely factual (the script was developed to tell the story), I thought that the movie was a bit educational. It tells the story of post World War II Jews that lived in limbo until the nation of Israel was established in 1948. I thought that it spoke much to the attitudes of all peoples involved in the resettlement of the Jews to Palestine - Jew, Arab and Gentile alike. Secondly, I think that the movie was made in the image of many epics of that film era. I felt that it was unnecessarily long and a bit tedious in many places. If I edited it today I think that I would have kept everything until the ship, named Exodus, landed in Palestine. After that I would have narrowed the focus quite a bit and left out the somewhat obligatory romantic interactions of the star actors, Paul Newman and Eva Marie Saint. I would have entirely cut the whole imprisonment and escape scenes - it simply did not add to the story. Lastly, I think that the movie would have been quite different if it was made today. It seemed odd to me to watch Gentile actors in the roles of Jewish people.. but I do think that was pretty common in Hollywood in those days. I also wonder what the action scenes would look like if shot today.. not sure that the newer technology would add much to the movie. So, I guess I was glad to see the movie - sort of. You might find the movie interesting if you are interested in this aspect of history. 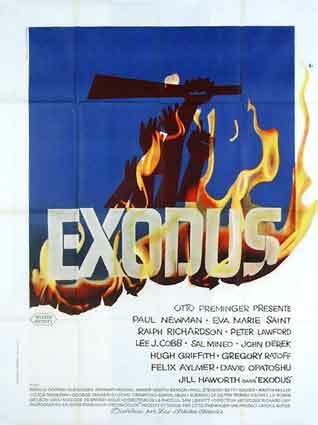 One a scale of ten I give Exodus ★★★★★. I loved the book, but don't remember the movie. Maybe I'll have to check it out at our library. I read the book years ago, but never saw the movie. Since reading you review..I will probably not take the time to watch it. I do appreciate your movie reviews, and have watched several you have recommended.